Early one October morning in 2010 a fire raged through Hastings Pier, completely destroying the upper deck and devastating what only hours earlier had been one the town's best-loved shoreline features. Yet, after the initial shock, a complete new beginning got underway, one which involved many of the town's inhabitants, and now nearly six years later, the new pier has just opened. While it's a major project for the pier's architects, practice dRMM, the opening also symbolises a happy ending to a broader story of a community getting heavily involved, bringing local politicians onside, raising funding and participating in recreating a 'totemic asset'. The pier's upper deck was destroyed by the fire in 2010. It had already been closed for four years. The old pier had been home to the kind of gaudy seaside entertainment that linked the 20th century with its 1862 beginning - fruit machines vying with dodgems and other fairground attractions, tea-rooms and ice-cream vendors. Prior to the fire, Ramboll's marine engineers were already engaged in intensive remedial work on the Victorian ironwork. 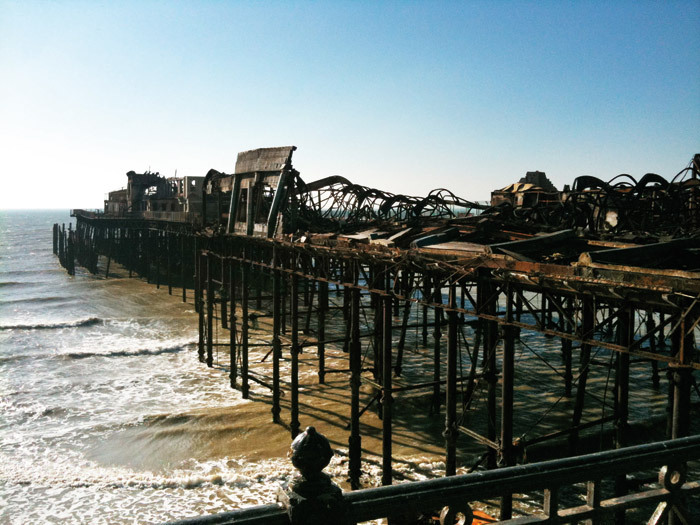 Designed by Eugenius Birch (also architect of Brighton's West pier), the ironwork was in a bad way by the turn of the millennium, and the pier was closed in 2006 by Ravenclaw, its Panama-registered owner, and left, it seemed, to slowly disintegrate. The closure concentrated minds, and the inevitable public meetings, the setting up of the Hastings Pier & White Rock Trust to buy the decaying structure back for the town, and years of campaigning tussles with the council, including a large march through the town in 2009, became known as the Battle of Hastings Pier. It brought on passionate debate and restrengthened the community's stubborn determination to remake the pier its own and reimagine it for the 21st century. 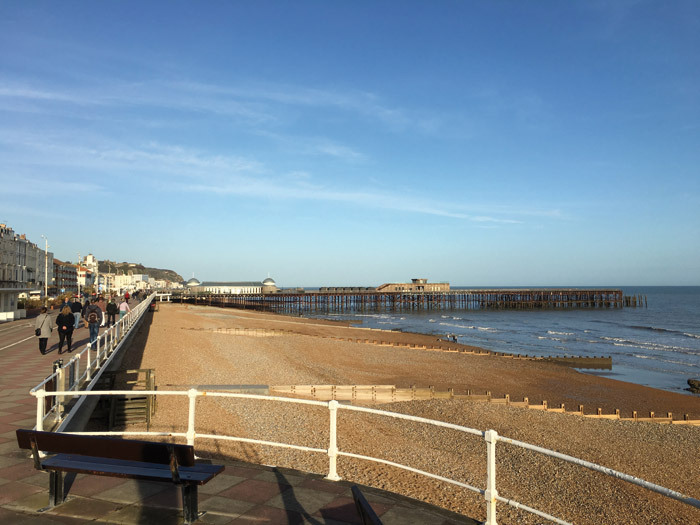 The Hastings Pier Charity (HPC), which evolved out of the Trust, secured its first funding, eventually bringing in £14m and managing the project. 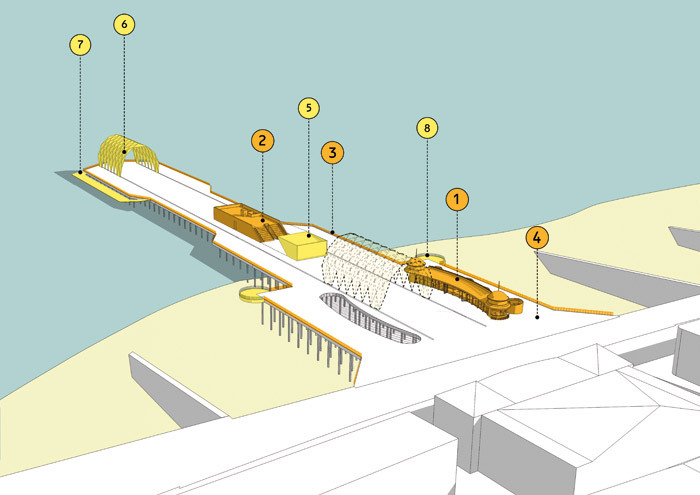 Both the HPC and the opening of the pier this spring are part of the town's broader efforts at regeneration, which are themself part of a regional cultural strategy to build new life along the entire South East coastline, running from Thames-side Kent to East Sussex's south-east corner approaching Brighton. It's called, by marketing executives, the 'String of Pearls' - a series of cultural venues, including David Chipperfield's Turner Contemporary in Margate and the restored modernist Bexhill-on-Sea De La Warr Pavilion by Erich Mendelsohn and Serge Cheymayeff. These venues are beginning to provide a cohesive, overlapping cultural identity to this part of England's coastline. Apart from the cultural investment, the main thing that links all these coastal communities is that the towns are some of the most impoverished in Britain. If poverty is often considered shorthand for the North/South divide many of southern England's seaside towns tell a different story. These destinations were at the heart of Victorian-era tourism, growing rich on Londoners wanting a day, a weekend or even a week by the sea. The twentieth century saw a slow decline until the disastrous advent of cheap foreign package holidays in the Sixties. The tourists all but disappeared and the towns went into freefall. Hastings, with its once-grand Georgian crescents, its long beachside promenade, and its Victorian New Town equivalent of St Leonards, is a graphic example of the challenges faced by seaside towns all over Britain. With a population of 90,000, the kind of problems which come with poverty are familiar and well known, and Hastings sank to joint 13th most deprived English town, alongside Stoke-on-Trent, between 2010 and 2015. It remains the most deprived town in the South East. Not surprising then that Hastings has been a focus for regeneration, beginning around 2002 with a first masterplan by Barcelona's MBM. That resulted in a useful, if under-inspiring, new rail station concourse and higher education buildings, alongside a reworked streetscape down to the eastern Old Town. It's also, since early in the new millennium, along with sister town, St Leonards, become something of a hipsterville Hoxton or Hackney-on- Sea. A wave of 30-somethings, drawn by the faded grandeur, cheap housing, and the romance of the down-at-heel seaside atmospheres, has created one of the liveliest regional creative scenes, top-heavy with artists and makers doing their thing. And in 2012 Hastings' own pearl, the Jerwood Gallery, opened cheek by jowl against the Old Town's black tar fishing huts. While bringing in the cultural pound, the Jerwood doesn't always feel connected to the majority of Hastings inhabitants and their lives. By contrast, after being brought back from the edge, the 'People's Pier', as it's been dubbed, seems like the most inclusively bona-fide community regeneration project in Hastings so far, with better chances of drawing the town together now that it is finally complete. 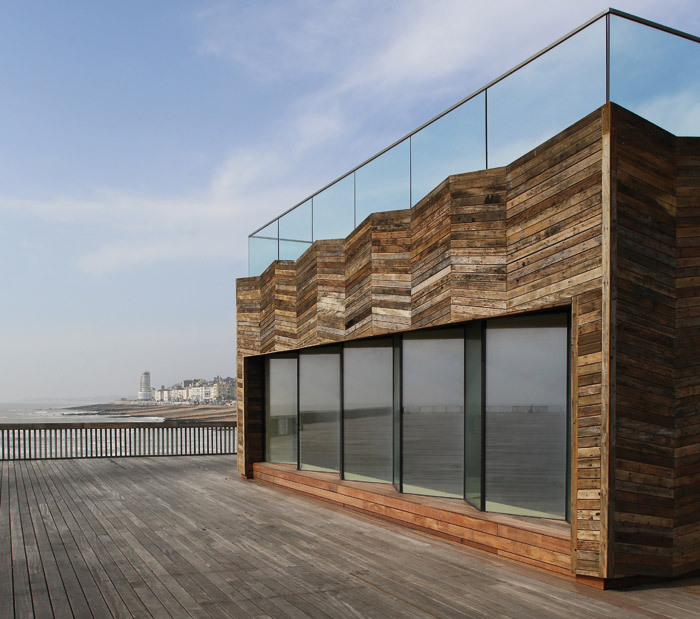 'Hastings Pier is an architecture of events, rather than an architecture of objects,' says de Rijke today, five years after dRMM won the open competition. The HPC choice of dRMM feels smart, completely at one in both the hipster and populist stakes. dRMM's back catalogue underlines a playful, participatory approach that extends from its early Kingsdale School in south London, complete with a translucent ETFE roof above a deformed geodesic events chamber, to the much more recent Chapel of Love on Blackpool's seafront promenade, the latter's name mixing dRMM's penchant for dry irony with the pleasure principle. The re-envisioning process for the pier emerged out of many meetings between the pier's Trust, a broad swathe of community groups and dRMM. The practice's participatory approach chimed well with the community. 'We always saw it as less static, more dynamic,' notes Michael Spooner, the project's architect for several years, 'a stable, sustainable platform for events of all kinds.' The result is 11,200 sq m of wide, open and flexibly empty deck for quick turnarounds between circus big tops, films and gigs. 'Nobody was going to want a shanty town of huts at the end of the pier,' says de Rijke provocatively of the sizeable deck space there. Open deck has replaced Birch's original Oriental Pavilion, built for up to 2,000 party-goers - and which hosted the likes of Jimi Hendrix, the Rolling Stones, The Who and Pink Floyd - which the fire completely gutted. Its partial replacement will hopefully be a sliding events canopy, into which dRMM, working with the erstwhile Ramboll's engineer and structural experimenter, David Tasker, have poured many hours to create its engineered, folded shell design. 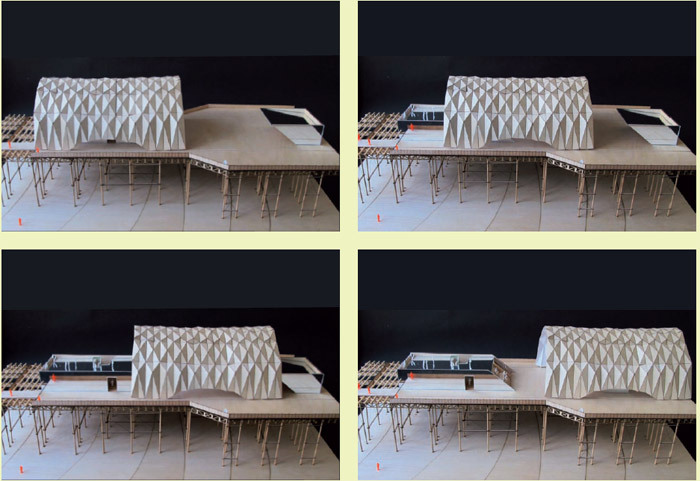 A fusion of earlier dRMM projects Sliding House and its unbuilt 2012 Olympic timber stadium experiments, the Sliding Canopy was cut from the first phase budget, though it may yet be part of the second phase. 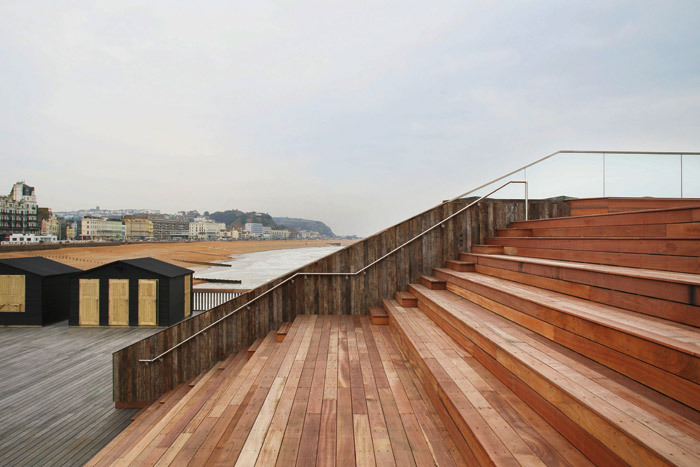 In Hastings the deck is covered with eke, one of the toughest African hard woods, used on exposed marine environments. At the town end is the one remaining pavilion building, which survived the fire in good-enough shape to be reused. 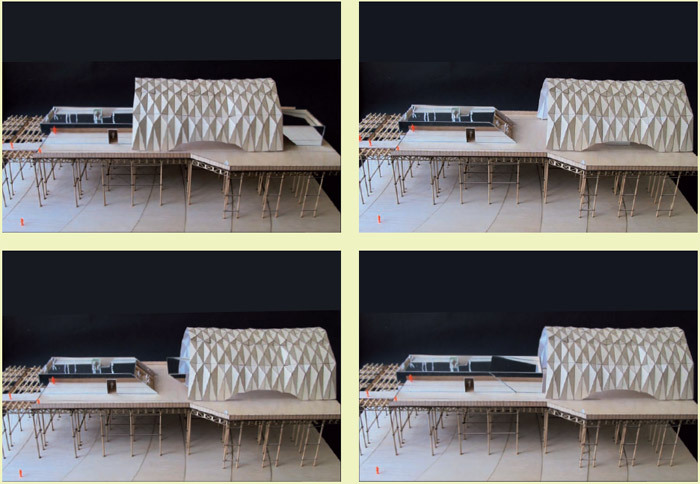 dRMM has reworked the zinc-roofed building into several sections, including a fish and chips stall, bar and restaurant. Two new timber pods sit at the back providing toilets. 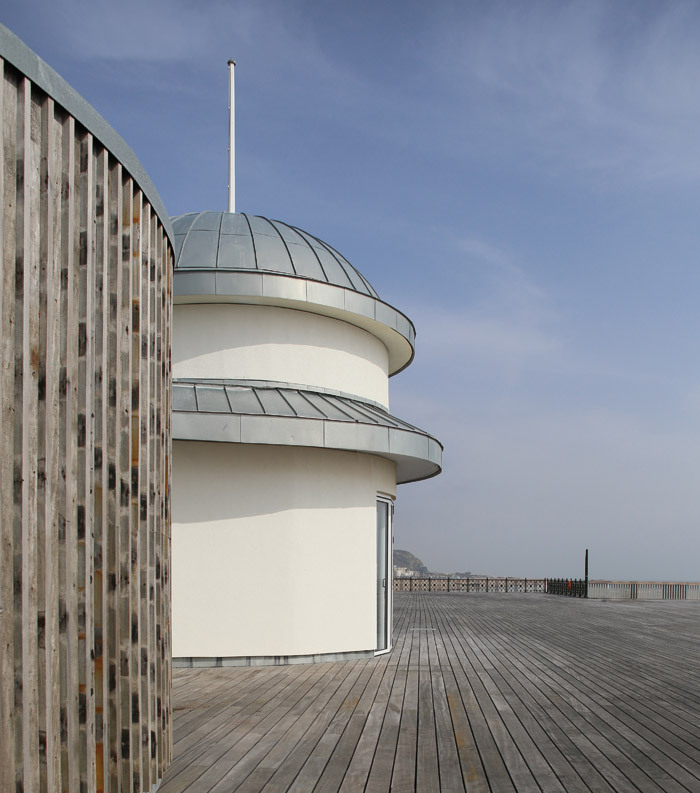 About halfway along the 270m-long deck is the semimandatory visitor centre, integrating an educational room, which includes a digital archive of the pier's history. This educational hub is a mix of dRMM's signature material, CLT, and recycled wood rescued from the under-deck. The chevron design is intended to work with sunlight streaming in and reflecting differently on to the south-window wall during the course of the day. The recycled wood has also been liberally upcycled, into tables for the pier's restaurant, a local bar and much else. 'And,' adds de Rijke, 'you can be sure they've made their way into the patios of all sorts of places across town!' Facing this visitor/education hub is an all-CLT outdoor seating auditorium for open-air films, gigs and community events. 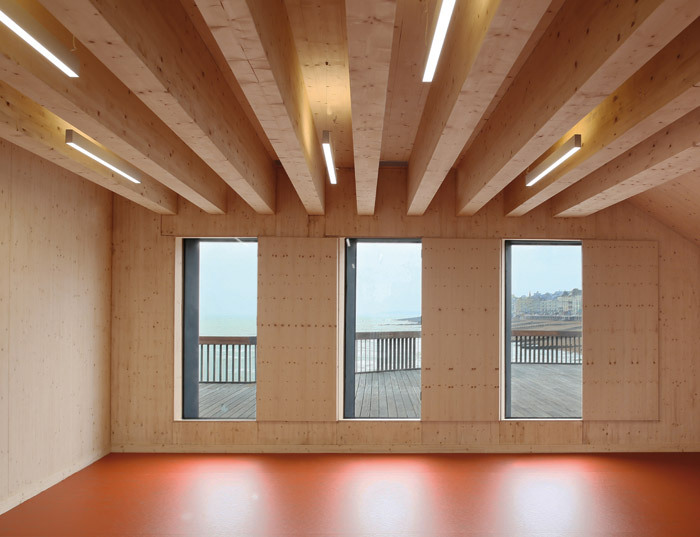 The educational remit aligns Hastings with Southend Pier, one of the few other early 21st-century new pier redevelopments, which was designed by Sweden's largest studio, White Arkitektur. 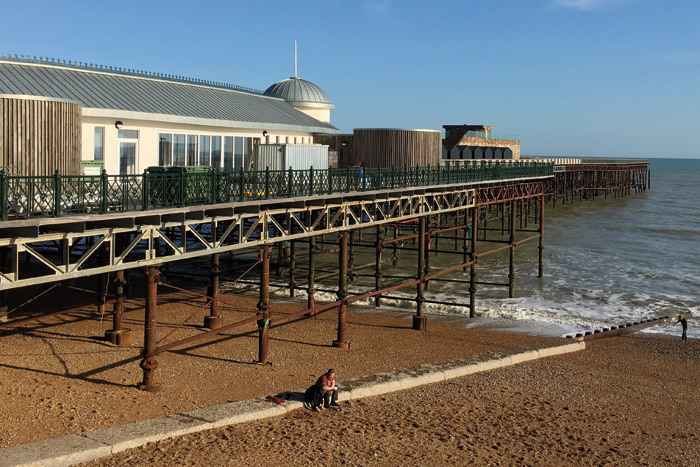 A key difference, as de Rijke is keen to point out, is that given the choice not to replace the Oriental Pavilion, there's only open space at the end of Hasting pier's linear extension into the sea, unlike Southend's. As with Southend though, the pier feels thoroughly 21st century, with its blurring of art, entertainment and education - a whiff of Victorian improvement. Jess Steele of the HPC outlines its vision of 'a 21st-century pleasure pier'. 'We did a lot of research into other piers and felt they were all facing great challenges to progress from the old version... We had the chance, particularly after the fire destroyed almost all the old buildings, to leapfrog that phase and create something fit for future enjoyment. So yes, culture and education, but also fun! It's really important that piers are classless - "flat, free and accessible to everyone". This is not high-brow culture like the Jerwood, nor is it stuck forever in bingo and chips.' So now the real work starts and will be watched by all those involved in the String of Pearls marketing and cultural strategy. For those most immediately involved in the pier, though, you get the strong sense of a collective sigh of relief. HPC's Jess Steele believes 'the opening of the pier brings this long and important story to a climax... it's already had a big impact on how the town is perceived as "on the up".' From here on in, if, as is hoped, the People's Pier prospers, it will serve as example and reminder of how communities can take matters into their own hands, and how popular culture, as much as high 'art', can be effective as an instrument of regeneration, if not more so. For dRMM it has been a journey with the practice becoming thoroughly immersed in piers and pier history. Although piers are not the most populous of typologies, de Rijke says he would love a second bite at the cherry to continue what's been started here in Hastings. In a less-than-crowded field there are a couple of contenders, again both the result of major fire damage: Weston- Super-Mare, and probably best known, Brighton's West pier.